Hope Knight is a hugely influential art educator. She maintains a very exciting blog, Mrs. Knight’s Smartest Artists, where she shares her amazing projects. She also is active on Instagram so be sure to check her out! She seems to always be sharing new lessons that I want to try out in my room, so I’m thrilled to be able to have this discussion with her! This is Hope’s 27th year teaching. All of those years have been in elementary schools in Georgia or South Carolina, except for one year teaching at the middle school level. She has a BFA in drawing & painting from the University of Southern Mississippi (1990), and received her teaching certificate from the University of Georgia. Hope, I think you have such a refreshing approach to teaching art. When looking at the projects you’ve developed over the years, it seems evident that you put a premium on exposing students to a comprehensive variety of mediums, cultures, and techniques. Is this a fair assessment? How does this tie into your overall philosophy? Absolutely! It is my job to open the world of art to my students and explore many different avenues of creativity in order to make as many connections as possible, because that’s what it’s all about. I like to create an environment in my classroom where kids can feel inspired and truly engaged in the creative part of learning during their school day. Art has been the most influential factor in my life, and my goal is to help students find their own appreciation for art, whether as an artist themselves, a creative thinker, or just a well-balanced human being. We all know that art making involves various levels of critical thinking. However, I think your projects amp this up by letting students make their own comparisons and discoveries. This is evident in how you sometimes let students choose their own art materials for a given project (crayons or sharpie, for example), which gives them more agency. This is also apparent, in a different way, with projects like the one inspired by Rockwell’s The Connoisseur. This project is absolutely one of the most clever and multi-layered projects I have ever seen. It involves different moments in art history, opposing visions of art-making, and requires students to place themselves in a transitional moment in history. I could go on and on about the brilliance inherent in this lesson. Anyways, is this component of your practice--pushing students to think critically in a very challenging yet engaging way--intentional? I have to say, lessons like The Connoisseur are challenging because, as you noted, there are so many concepts at work. I think that particular Norman Rockwell painting is a perfect example for teaching, because of its complexity and storytelling quality. Comparing and contrasting artist styles has always been in my teaching repertoire, and this particular work was such a fun way to talk about Jackson Pollock and Norman Rockwell, and believe it or not, they actually do have some similarities. It is especially fun to look into their studio spaces, both made from old barns in the New England area, and look at the contrasts there as well as in their work. Students may find themselves relating to the ideal realism and precision of Rockwell, or they may lean to the energy and excitement of Pollock’s action paintings - either way, they get a bit of both with this lesson. They also get to play the part of the critic, as they strike a thinking pose for their photographic part of the work. We have done the action painting part of the lesson with real paint and also digitally using an app. Combining technology and art was a pretty new thing for my elementary school back in the days this lesson was developed. You can find several articles from different years about this lesson on my blog: here is a link to one. 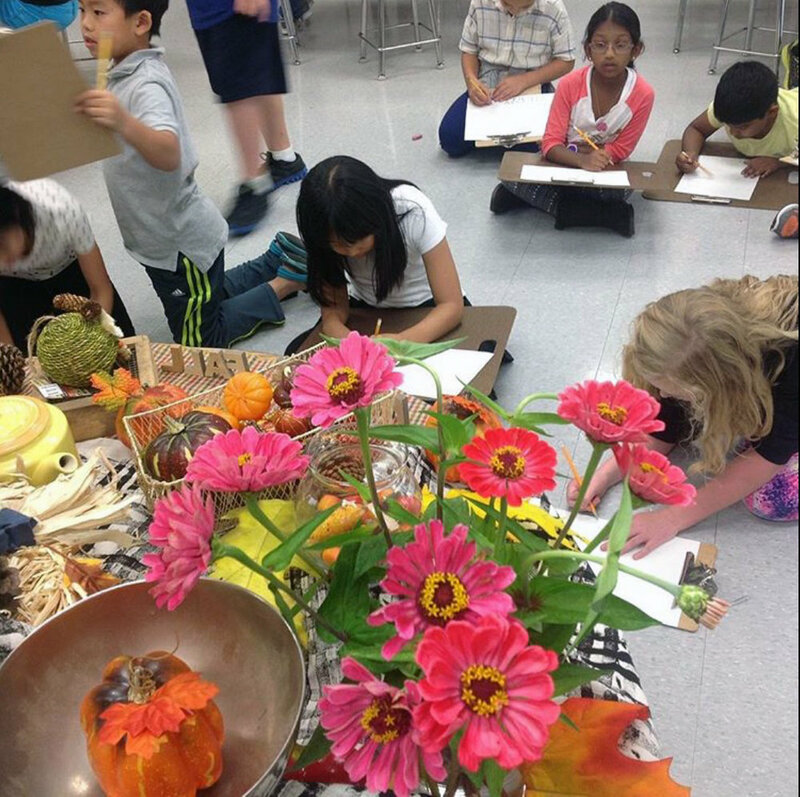 You definitely don’t seem to shy away from rigor--it looks like you incorporate several observational drawing projects into your curriculum. Whenever I teach observational drawing to elementary age students, I’m amazed at how they rise up to the challenge and become incredibly focused on the task of observing and recording what they see. I often think that children’s drawings from life are much more interesting than what most adults can produce--they are fresh and fluid, rather than overwrought or self consciously executed. Why do you place an emphasis on this particular skill? Seeing, REALLY seeing, is the most important skill you can have as an artist. The ability to drop what you think you know about an object or a person and see it for what it is artistically through line, form, value, color, is really what making art is about for me. I spent many years making observation drawings on a daily basis and I can’t think of any better practice for growing artistic ability. We have limited time in the art room for production, 45 minutes a week, but if I can teach a kid to see as an artist, they can carry that with them into their life. We do spend a good amount of time drawing from imagination as well, but the more time we spend observing, the better the drawings get, no matter what style. In addition to your projects being rigorous, they also look really fun! I admire how you strike that balance. You seem to provide a structure and clear learning objectives, but provide students options at the same time. Can you talk about how choice fits into your projects? Is this important to each lesson? Is there such a thing as too much or too little choice? Because I teach younger students, K-5, I limit the choices depending on their ability levels so they don’t become overwhelmed. For example, a younger student might choose a color scheme or a pattern, while an older student may have more choice in the subject matter as well. I have found that too many choices in a 45 minute elementary session leads to chaos and confusion for the kids, although I do believe some choice is important so the student has an opportunity for self-expression. I am also a believer that creativity is best when there are boundaries in place, or a problem to solve - especially with a short time limit. Process and product are equals in my classroom, and there are certainly times when we focus mainly on process, without concern for the look of the final product, but those times are called exercises, so that students understand the difference between experimenting and producing something that demonstrates good craftsmanship and expression. I ensure that all my students experience a wide variety of media each year, including traditional 2-D techniques as well as fiber arts, clay, basic photography and even publishing their art through Artsonia. You’ve been teaching for a while now, but it seems as though you are frequently teaching new lessons. About what percentage of your projects are new each year (ballpark is fine…). Do you think it is important for teachers to develop new projects every year? Do you have a few lessons that you know you will always teach each year because you love them so much? I would guess it’s about a 50/50 split. I embrace my old favorites but I can’t imagine not developing new projects with the amount of inspiration there is in the world! I do different lessons with each grade level, so even if I repeat a lesson, it isn’t a repeat for the students - although there are certain exercises we do every year, like gesture drawing. We have also been doing pet portraits in all grades for several years to support our local animal shelter, and it has been great for the students to see their ability grow each year as they complete a new portrait. There are a number of lessons that are personal favorites I do every year, like clay dinosaur fossils in kindergarten and a Van Gogh unit in first grade. I have a curriculum to follow from my county that is based upon national and state standards, but we have much flexibility with the way we teach the standards. The inspiration to try new subject matter or techniques is everywhere now with social media, and I am grateful to all the teachers who share and keep everyone excited about teaching the same standards in new ways. Let’s talk about failure (I know, really positive). Although I do like Instagram, I definitely think we get a skewed version of everyone’s work. However, I personally think failure can be a good thing sometimes. Do some of your projects fail each year? Do you think it is important to fail from time to time? Absolutely. It is usually a result of trying to do too many things in one work. Whenever I try a new project, I always tell the kids that we are going to try it out together, and we may discover that we make some changes along the way. I like to promote the idea that it is ok to fail, and that even the projects that don’t work out as planned are great practice for the next. I love the “ooh let’s try this!” attitude - it lightens the vibe in the room and we have fun experimenting. It is actually pretty rare for a lesson to look the same for my Friday classes as my Monday classes - I am always making changes as I watch the kids each day. This is why I choose a bare bones approach to actually writing lesson plans - it is always a work in progress :). It’s always interesting when a beloved project doesn’t turn out as successfully as a previous year - I’m often left scratching my head, wondering how my teaching was different or why the kids weren’t as engaged. You make some wonderful hand-drawn handouts that you use in your classroom and share via your teachers-pay-teachers. These are works of art in themselves! Can you talk a bit about why you started making these and sharing them with the teaching community at large? I started my Teachers Pay Teachers shop just before my daughter entered college as a way to make a few extra dollars - I had established my blog at this point and was sharing different resources, and I was hearing other teachers talk about making some extra income through the site. I wanted my resources to have a “sketchbook” feel, so I tried to use hand-drawn illustrations as much as I could. I’m so grateful that other teachers have found these helpful and have supported my shop - I love learning from other teachers, and sharing what I have found to work in my classroom. Do you make your own art? Do you think it is important for art teachers to create their own work? That’s the million dollar question! I have had so many conversations on this topic. The short answer is yes, when I can. Every art teacher has their own timeline of when they can be productive as artists compared to being productive as an art teacher. I want to stress this point - Good teachers make masterpieces every day, creating inspired spaces with engaging lessons and efficient time and materials management, all while connecting with hundreds of students of different abilities and ages for a memorable art experience - whew! I can’t stress enough how this alone is creating art - it may not be something you can hold or hang on a wall, but it fulfills me as an artist. I have been an artist since I was a young child and will continue to be for the rest of my life, and the definition of that has changed over the courses of my life. Sometimes I focus on creating for myself - I go through phases of painting, drawing, printmaking, clay, embroidery, weaving - when I have time to put into it. As a wife, a mother of kids and pets, a daughter of an aging mom, and a full-time teacher, I have learned to embrace the moments of creative time each day that fulfill me as an artist, even when it doesn’t involve production. What advice would you give to a first year art teacher? First, I would encourage them to stay flexible and keep an open mind, because things change all the time in schools. Just when you think you have something down pat, a change comes along :). Another thing I struggled with my first year was moving too quickly through a project - I still do this sometimes when I am trying to put too many things in one lesson. It is hard sometimes when there are so many connections to be made! But I do check myself regularly and make sure we are really letting the main points sink in by sloooowing down. Another struggle we have, being a teacher to HUNDREDS of students each year, is making deeper connections with individual students. It can be a real challenge when you only see them for 45 minutes a week. I try to constantly rotate the room when they are working and engage in conversation with kids who may not be comfortable sharing ideas in front of everyone - I was a shy kid myself. Making those personal connections is always worth the extra effort. Who are two art educators that you find particularly inspiring? I have had many fantastic art teachers myself over the years, including my high school art teacher Amanda Breckenridge, who introduced me to printmaking at the college level while still in high school which inspired me to become a teacher, because she was all grown up and still having fun! I also have the most incredible colleagues - my longtime friend English Avery is an elementary art teacher at a neighboring school and serves as a Fine Arts Support Teacher for our county. Not only is her classroom a joyous place and her student work exemplary, but she is such a fantastic role model for up and coming art teachers in our county. You can find her on Instagram: @medlockartists. What are your two all-time favorite projects that you teach? Why are these your favorite? I have to list printmaking, in any form, as one of my favorites, because of the surprise factor when the print is revealed. Personally, I love the graphic quality of a printed image, but as a teacher it is all about seeing the print through the fresh eyes of a new printmaker. I do printmaking in every grade, from stamp printing and monoprints to collagraph and reduction prints. A new favorite of mine is our #petpARTners program, which is a group of art activities that features homeless pets in our community shelter, in order to raise awareness and funds for the shelter. I started this program a few years ago when our school adopted the 7 Mindsets character education program, and I was inspired to create a type of community outreach using children’s art. I am a big supporter of pet adoption and my students love animals, so it has been a perfect fit. The dogs and cats of FurKids Atlanta shelter have been the subjects of many of our artworks including realistic portraits, clay portraits, and abstract fantasy pet homes. We love sharing our work in the community to raise awareness. Do you think assessment is important in the art room? What does this look like in your classroom? Yes, it is important, but it should not look like assessment in other academic areas. Most learning is assessed on a linear scale to show growth. Art learning doesn’t happen this way in my experience - in my mind it looks more like ripples in a pond, growing out in all directions. As teachers, we are required to assess in similar ways to the classroom teachers in order to be “valid” - however this is not an effective method, and I am hopeful that the powers that be will see art for what it really is to the whole child, and understand that the measurable growth from art learning will be evident in their ability to think creatively and solve problems. If I could make the decision for how we assess at the elementary level, it would be based on the evidence of their art portfolio and their participation - we also do a lot of reflection activities at the end of a unit, where we talk and write about our learning. They are experimenting and trying new things at this age, and shouldn’t be pressured to achieve mastery. What about technology in the art room? Do you think it should be a focus? Students are bombarded with technology in school and at home, so the majority of our art time is screen-free. We use technology sparingly but effectively - we use iPads for research, and also to publish our art to Artsonia, which includes photographing and editing our work and writing titles and artist statements. Artsonia is an online art gallery for students, which allows them to share their art with friends and family while growing their digital portfolio over the years. I do see teachers using it in creative ways all the time, like Don Masse’s super cool symmetry creations superimposed into photographed settings - I have this bookmarked to try out soon. What have been the biggest challenges you’ve encountered within this profession and how did you navigate them? Still navigating daily! The biggest challenge for me has always been the fast pace combined with a packed schedule and large class sizes. Juggling six different grade levels every day, each with their own standards, projects, and ability levels requires LOTS of time for prep and planning, not to mention time for presenting the work at completion. It is a never ending cycle - very worthwhile, but always exhausting and often challenging. Within the profession, what issues do you think art teachers need to be talking about most right now? New buzzwords and initiatives are always making their way into schools and even into the art rooms - nine times out of ten, I think “art teachers already do this.” PBL, technology, STEAM, personalized learning… of course all these things CAN work in our art rooms because we do this kind of thinking all the time. But, I think it is important not to get TOO caught up in educational trends - take from these what enhances your students’ art experiences and stay focused on the real work of growing creative thinkers. My hope is that our work will build generations who understand the importance of the arts in our lives because of our need for self-expression and human connection.